The PARC Group, master developer of Nocatee, recently revealed their newest community in Northeast Florida- eTown. 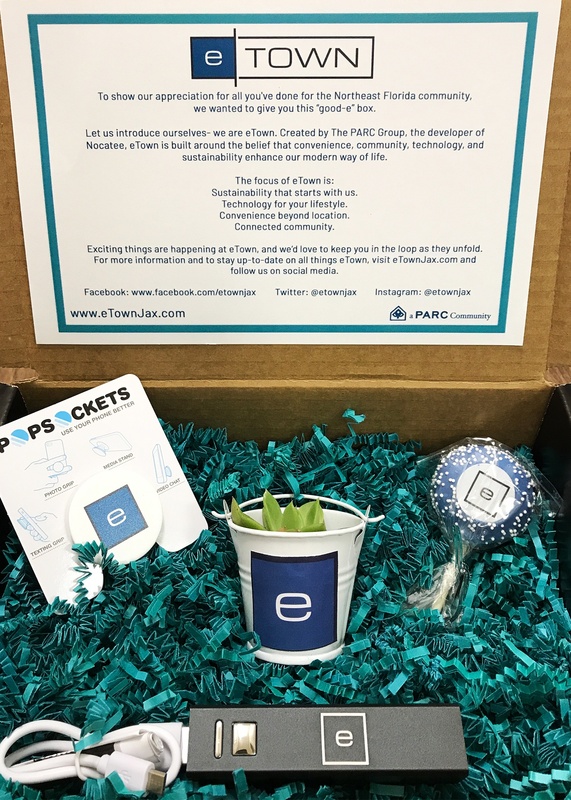 The “good-e” boxes contained a succulent, a Popsocket mobile phone accessory, a portable mobile power bank and a cake pop- all featuring the iconic "e" found in the new eTown community logo. The PARC Group, which is developing the community in South Jacksonville along Interstate 295 and Florida 9B, is delivering packages around Jacksonville to introduce the community. Sustainability that starts with us. eTown is built around the belief that convenience, community, technology, and sustainability enhance the modern way of life. Greater details explaining the philosophy behind eTown can be found on the community's new and interactive website. Stay in the loop as more exciting news unfolds. For all things eTown, visit eTownJax.com and follow us on social media at facebook.com/etownjax and on Twitter and Instagram @etownjax.